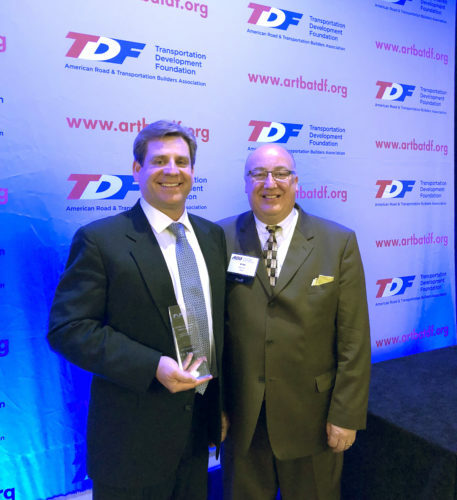 Vice President Mark Barkowski traveled to Washington, D.C. to accept the second place award for the national American Road & Transportation Builders Association (ARTBA) Safety Award. Paschen has successfully kept our EMR below .7 for over 4 years. In 2017, we were proud to announce that we had zero lost time incidents, with over 1 Million man hours of work. This prestigious award is largely due to our top-down, bottom-up approach to safety. Our safety committee meets weekly, and includes vice presidents, general superintendents, and tradesman who all discuss ways to increase safety awareness and prevention. Our multifaceted Safety-Education program – for both field and management staff – had the expected outcome of reducing employee injuries; while continuing to perform dangerous, high-risk work. The systems we have in place played an influential role in our acceptance of this award. We take pride in our proactive safety approach, which includes subcontractor coordination and improves our field operations. Our Job Hazard Analysis (JHA) system allows our construction crews to analyze the work that will be performed each day and document potential hazards. Lastly, our quality control system, which was modeled after the U.S. Army Corps of Engineers, is a three-phrase approach that reduces the amount of rework performed in the field, while making the work safer for our workforce and our subcontractor’s workforce. The ARTBA Foundation Awards Luncheon was held at the Grand Hyatt Washington in Washington, D.C. on May 15th, 2018. For more on our Safety Program, click here. More coverage on the ARTBA Awards found here. Mark Barkowski received the Second Place ARTBA Safety Award on behalf of F.H. Paschen at the ARTBA Foundation Awards Luncheon, held at the Grand Hyatt Washington in Washington, D.C. on May 15th, 2018.